Our thanks to David Wrenn and the Nelson Memorial United Methodist Church, in Boonville, for producing and sharing this video which tells about their winter coats for kids outreach mission. For further information about the ins and outs of their â€œKidsâ€™ Coatsâ€ program contact the church at 660-882-6223. If you have produced a video about a mission outreach ministry of your congregation please let us share it with the conference as a MissionCast. Contact Max Marble at maxrmarble@gmail.com to share your video. The Athens United Methodist Church organizes a Thanksgiving Dinner for the international students attending the University of Georgia. This UMTV video shares with us this outreach ministry. Angie Olsen, Co-coordinator of the Festival of Sharing, helped show quilts at Schweitzer United Methodist Church in Springfield and took some great pictures of the beautiful quilts which were displayed. 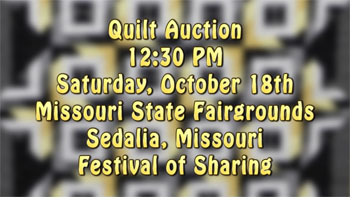 Over a hundred of these and other quilts will be auctioned during the annual Festival of Sharing, in Sedalia, at the Missouri State Fairgrounds, on Saturday, October 18th. The auction will begin at 12:30. A full day of activities are planned with food and informational booths, worship and the preparation of all kinds of kits for use after disasters and for distribution by food pantries and service agencies across the state of Missouri. Meet Joyce Wheeler who dropped out of High School when she became pregnant. She truly has found grace at Baby Grace. She shares how the ministry has been a huge help to her through the last 6 years during which time she has married, finished her GED and has three wonderful children. Baby Grace Ministry was born at the Buckner United Methodist Church in response to the needs of young mothers of their community. Through the ministry young parents receive parenting education as well as diapers, clothing, bedding, toys and books all donated by contributing members of the community. Everything they received is bundled up with a lot of spiritual blessings and a great deal of love. 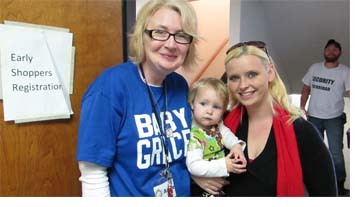 For more information go to www.babygrace.org. You can donate to the ministry online on the website or you can donate through your local church since the Baby Grace Ministry is listed as a Missouri Conference Advance Special. Our thanks to UMTV / United Methodist Communications for this video about a bicycle repair ministry which is building community among the kids in a diverse neighborhood. Our thanks also for paying your Church World Service Apportionment which has brought us this mission outreach video.